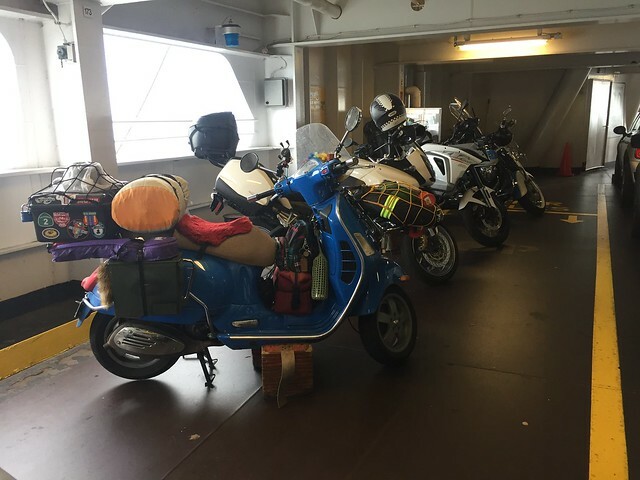 250cc Superhero: The Ferry Fancy Life, Port Angeles and Vancouver, BC. May 9 - 11, 2017. I got an orange tag for proving to the ticketmaster that my bottles were for spare fuel. Waiting for Ferry #1, with... an Amigo. 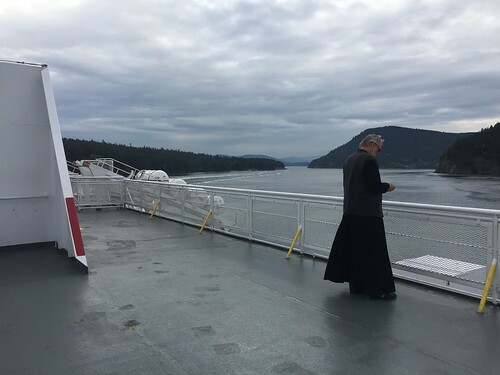 A short ferry to Kingston later, and I was on my way to Port Angeles. First stop? Swain's. You cannot stop in PA without visiting. Swain's. 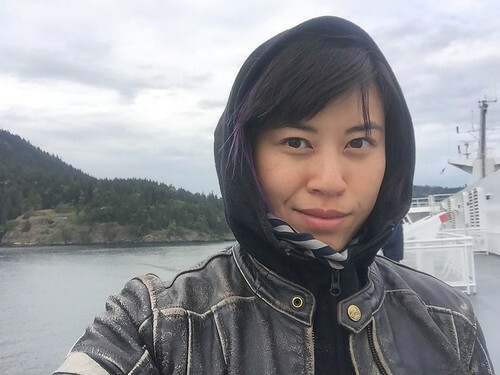 Every piece of camping gear I own, every silk liner, drinking vessel, lamp, or dry bag that I selected and curated for my personal needs at camping stores and Army Navy stores across America... It's all available at Swain's. It should be a national treasure. Also, their website is straight from the 90s (at least as of this writing in Oct 2017) and should be preserved as well. 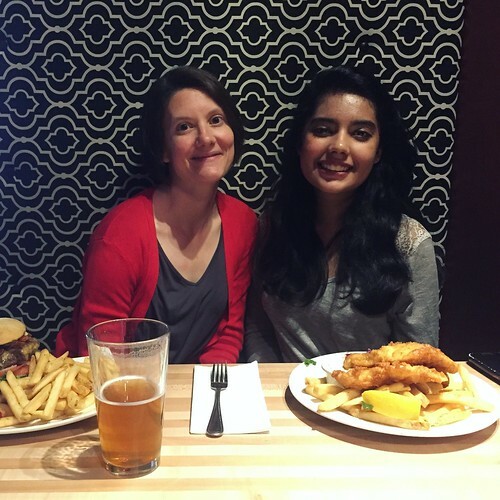 Thanks for dinner, Laura and Maham! Also found in Port Angeles: Laura! Originally from Verona, now living in PA. We met through Gwynne and Tom on my first time through the Port Angeles, during a campout at Tom's parent's home. This time, she brought special guest, Maham, an exchange student staying with them from Karachi. How serendipitous, when I mentioned I had plans to visit Pakistan, she told me excitedly about her home. After dinner, Laura showed us this tiny landing between new developments. 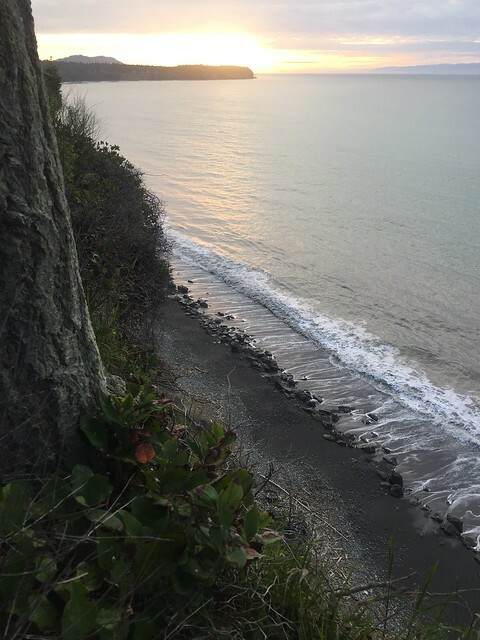 Canada is across the water. I wonder how many teenagers make out here. It's beautiful in that PNW way, and quite a drop. I must have been absolutely exhausted my first time through PA, because as Laura and Maham and I cruised around in the car, I barely remembered anything. 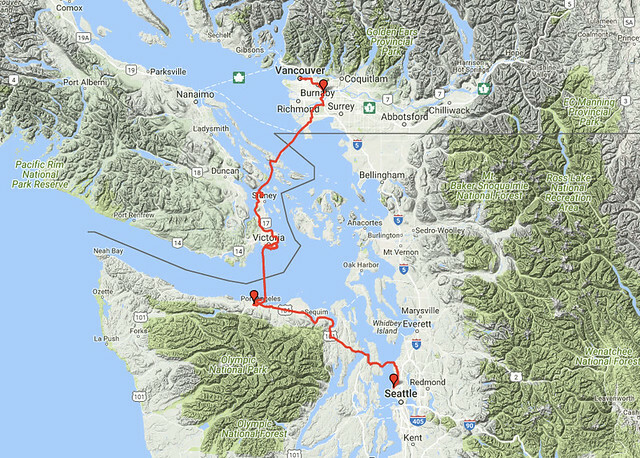 So I took a quick ride up Ediz Hook before catching the Black Ball Ferry. Woa, Ferry #2 is even fancier. It has a gift shop. Good thing Laura found this ribbon for me, so I could be fancy. I'm ready for you, Victoria, BC. Motos are first on, last off. The guy on an old BMW airhead was lashing his bike to the hull when I pulled behind him. Surprised, I asked whether the water got choppy enough to require tie downs. 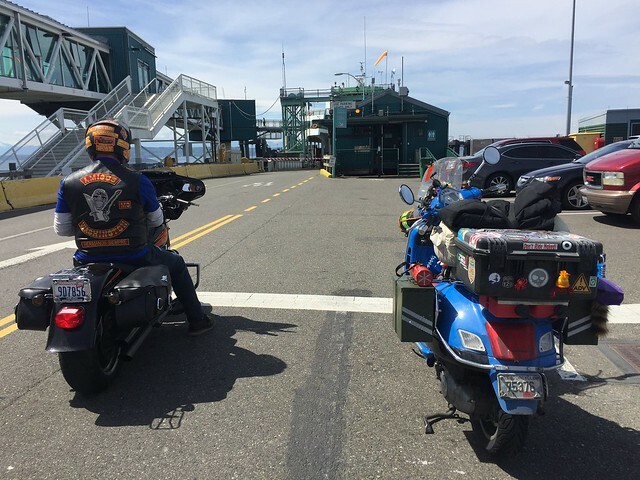 It was a stupid question, since he was tying his down I was clearly not going to risk coming back to the auto level to find my Vespa sideways on the opposite end of the ferry (I lashed down my bike, and the water was choppy enough that I became slightly seasick). 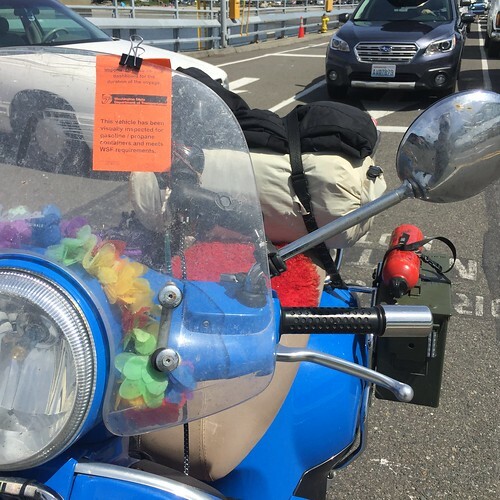 The BMW rider shared a fantastic story about outrunning cops in Oregon, and then described San Francisco as "dreadful" in his dry, British accent. Some kids had broken off his spark plug in that city. As for immigration? "Tedious." At the Canadian border, I worried if border patrol would live up to its reputation. 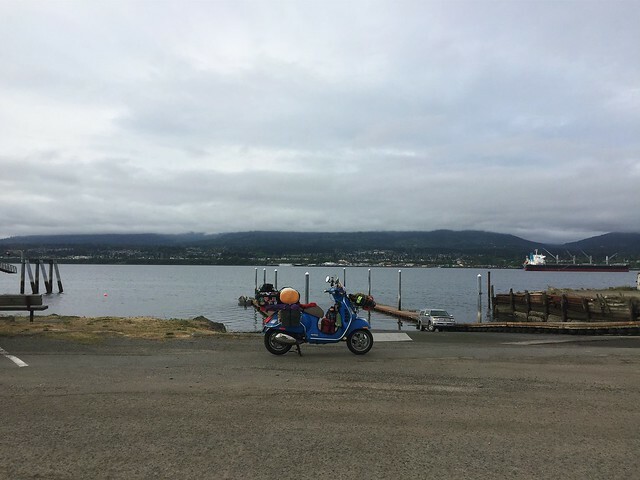 Instead, the border officer asked what year my bike was, because it turned out he collected vintage Vespas! "I have two VBBs and a 50SS," he noted cheerfully. "So, what are you plans in Victoria?" 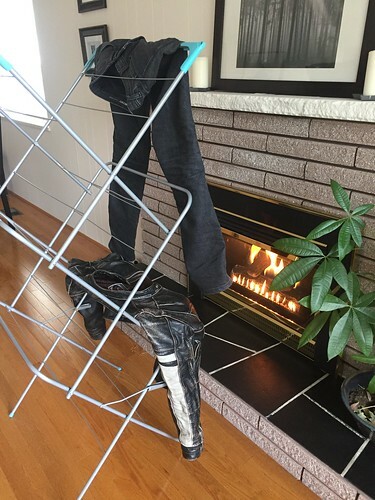 "Well, I have a reservation for tea at eleven," – he nodded approvingly, all but saying, Of course, that is correct – "And then I'm staying with friends in Vancouver." And that was it. 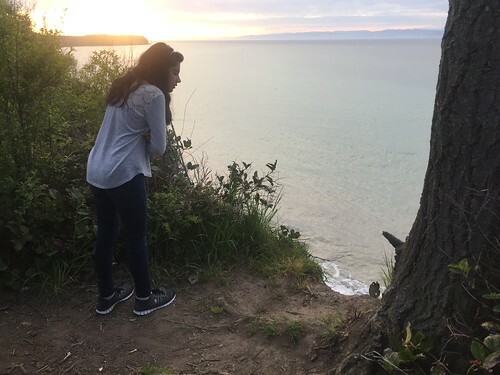 I was in Canada... again! Looking back at Washington from Canadian soil. 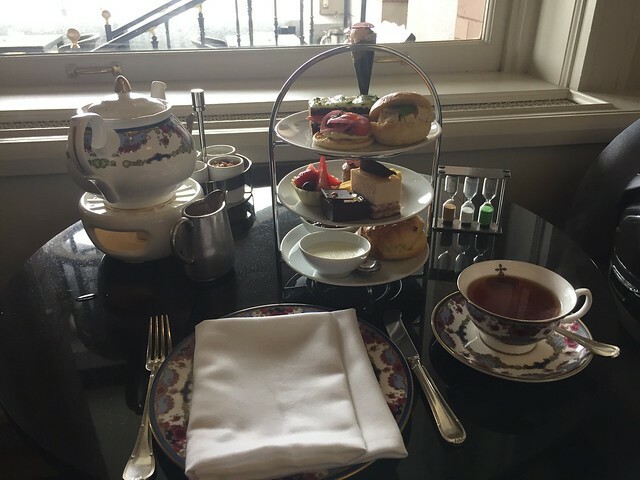 Back in Portland, Cydney had recommended having high tea in Victoria (in case ferry fees hadn't completely blown my daily budget out of the water). 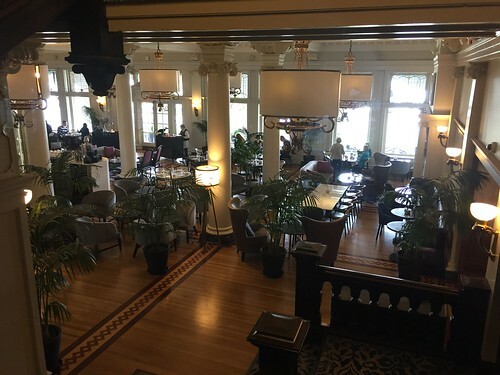 The Fairmont Empress High Tea was the natural choice, but the rate was jaw dropping...until I realized it was Canadian dollars. It was still more than I would normally spend, but as a Hong Konger, how could I miss experiencing cultural traditions from our mutual colonists, especially when they're in the shape of tea and confections? I made a reservation for the first sitting, and vowed to free camp for days. Dress code was listed as 'sophisticated, smart casual'. Concerned my riding gear wouldn't fit the bill, Gwynne and I crafted a plan before I left Seattle: I could borrow her clothing, and return it to her when she visited Vancouver later that week. In PA, Laura found a ribbon, which I attached to my helmet. The final outfit from our combined wardrobes? 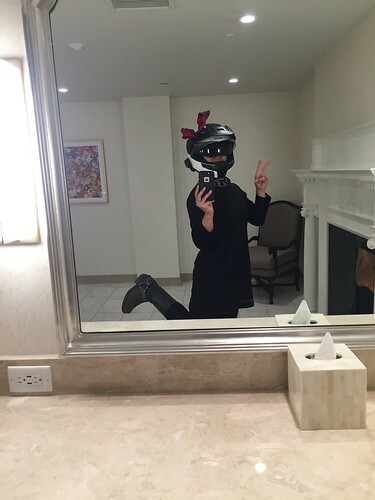 It looks like Kiki got a motorcycle. Or Emily the Strange Biker? 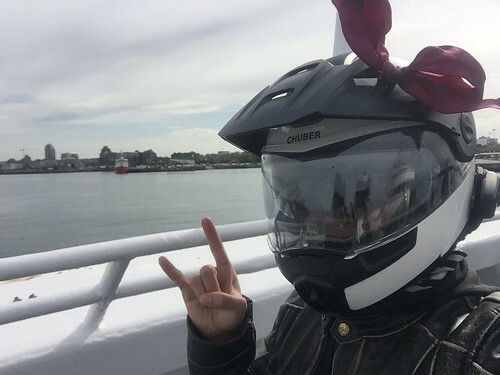 I'd like to say that upon arrival in the ladies room, dramatic music started playing and I started spinning in a magical girl transformation sequence, pulling off moto gear to reveal a glittering, superheroine vision of myself. The reality was less like the cartoons I watched as a kid. While not the most magical version of myself, I felt refined enough for a road outfit, and can confirm that the ladies room in the Fairmont Empress has a fireplace. 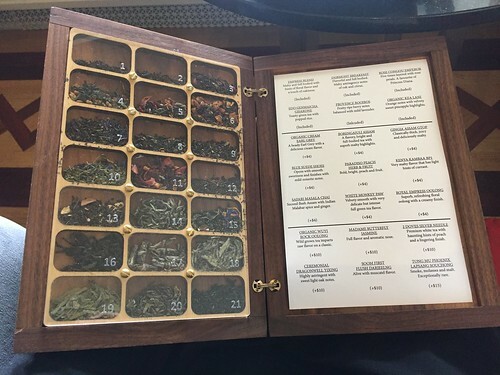 A fantastical engraved book of teas. I went with the namesake, the Empress blend. Live baby grand piano covers of Adele and other pop songs played softly. I settled into my table, folding all my gear in the spare seat next to me. An older waitress came to my cozy window corner, and checked if it was a table for two. "He dropped you off?" she asked, indicating the gear. "Uh, no. That's mine," unsure what she was getting at. "Oh..." she murmured absently, and then asked again whether I had any food allergies in a way that made me wonder if she'd deliberately slip them onto my plate. 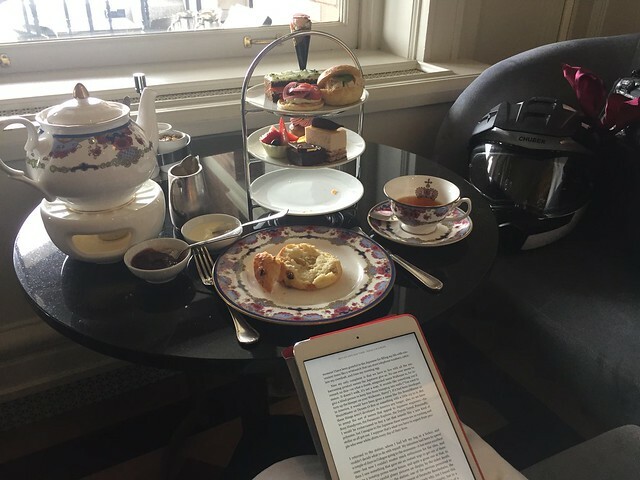 She must not have appreciated my helmet-bow, because she started my tea while I was in the restroom and neglected to explain the nifty hourglasses (they're for how dark you want your tea). Too bad, the scooter trash is staying, reading, and enjoying herself right into the next sitting! Medium-dark tea. I can't believe it's only now that it occurred to me that's why those little candles are called tea lights. The food tray has arrived, and it's utterly delightful. I'll be here for the next several hours, leisurely mowing through three tiers of delicacies. Between enjoying my book, I could eavesdrop on the guests around me. A young couple with a toddler kept the waitress too occupied to slip allergens into my scones (yes, feed it more sugar!). Three middle-aged ladies a table over were having the kind of birthday party I'd look forward to, so much so that I didn't have the heart to tell them that white chocolate is not in fact bleached (it's only chocolate by name, containing no chocolate solids whatsoever). While I have closeups of every item, this one was particularly fanciful. 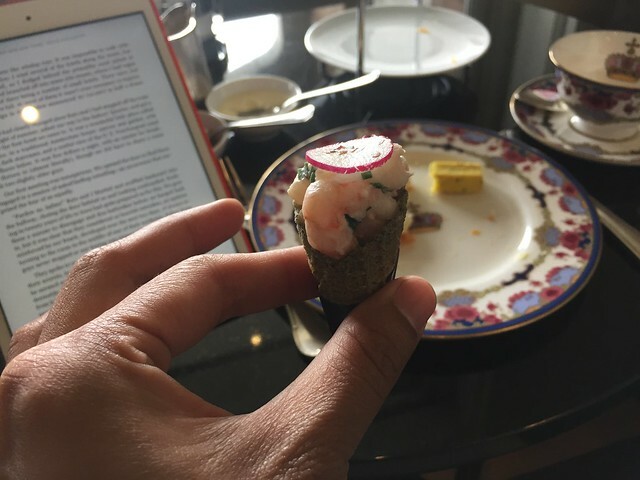 Hand peeled local shrimp, with ginger lemon marscapone, in a seaweed cone. I feel like a monster eating such adorable exquisiteness. The scones were perfectly flaky. The strawberry jam had a hint of thyme in it to keep from being overly sweet. The clotted cream would keep me warm on the early spring rides ahead. All these finger sandwiches were like European sushi, and every item was exemplary. 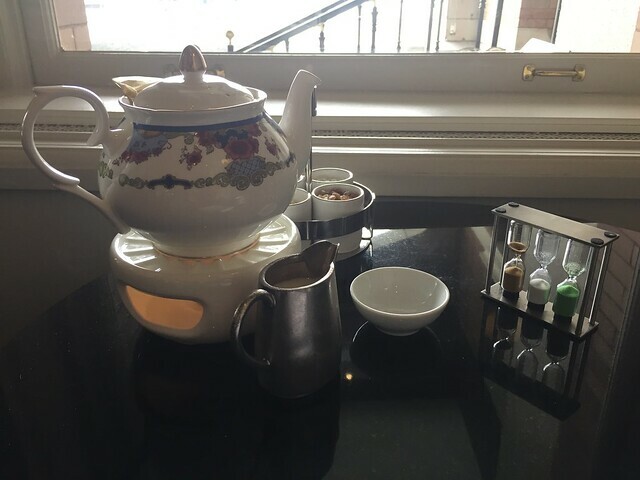 Fine tea, tiny foods, fancy China, wifi, and a window view... Why would I ever leave? Oh right, I should go before my parking fee ends up costing as much as this sitting (the parking attendant ended up waving me through, whew). 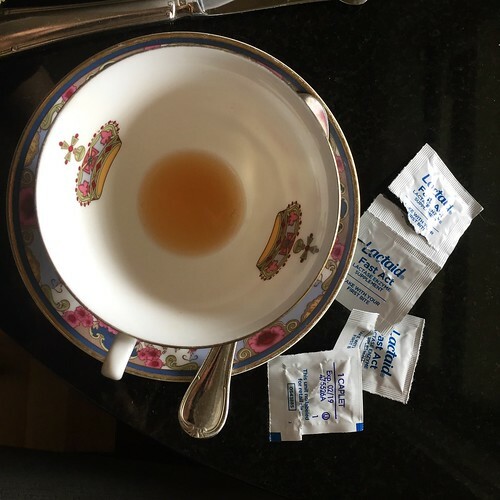 I make a habit of overlooking my lactose intolerance for Afternoon Tea experiences, and this one nestled in nicely with my memories of The Peninsula and Four Seasons in Hong Kong. I have no regrets. Scoot by other Victoria sights. 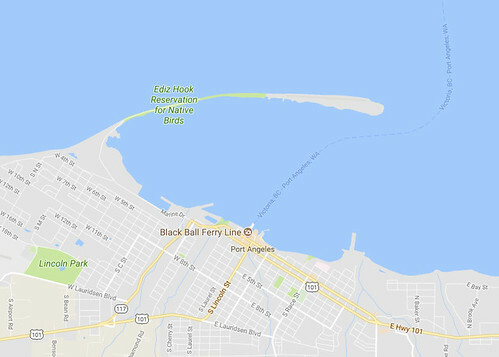 But I have another ferry to catch. Ferry #3 is also scenic. Delicate opals reflect off low clouds in the diffused light, and distant mountains are faded cobalt. Peacefully sailing by many green forested islands. 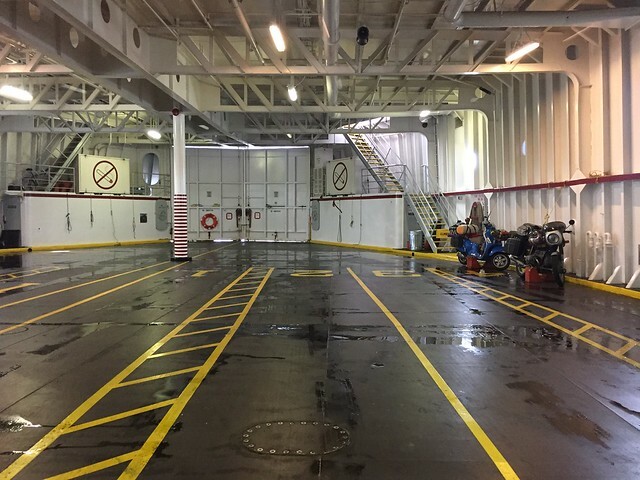 My third ferry in two days was the finest by far (once I found the secret button to open the steel door to the upper levels). 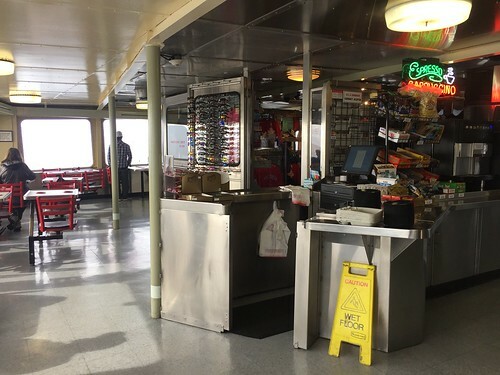 With 7 decks, a modern cafeteria, full-fledged restaurant serving beer and wine, gift shops with clothing, game arcade, business cubicles, and toddler play areas, it was clearly used to making regular commutes. Cantonese was popular onboard, but I also caught some Mandarin and other languages among the diverse passenger list. Also, I discovered a new favorite game to play with Canadians: Where is Rhode Island? Thus far, Maine and New York were top contenders. Passengers from many walks of life onboard. One of these bikes is not like the others. So, where do you guys think Rhode Island is? An unfortunate family emergency meant I was out a place to stay in Vancouver. 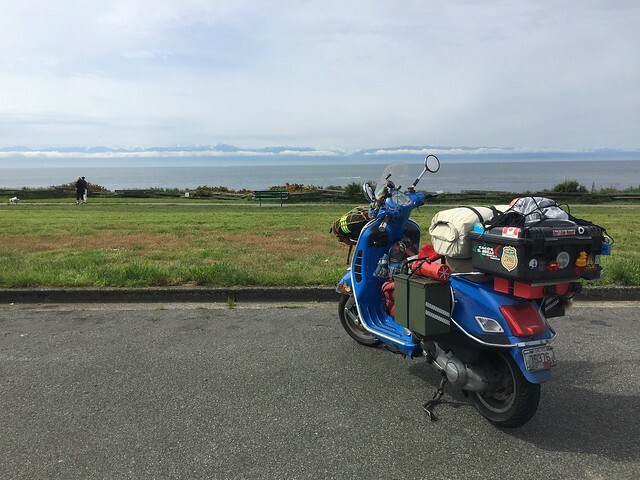 Surely I could find a hostel or Airbnb, but I'd been looking forward to meeting some of the scooter scene in Vancouver. 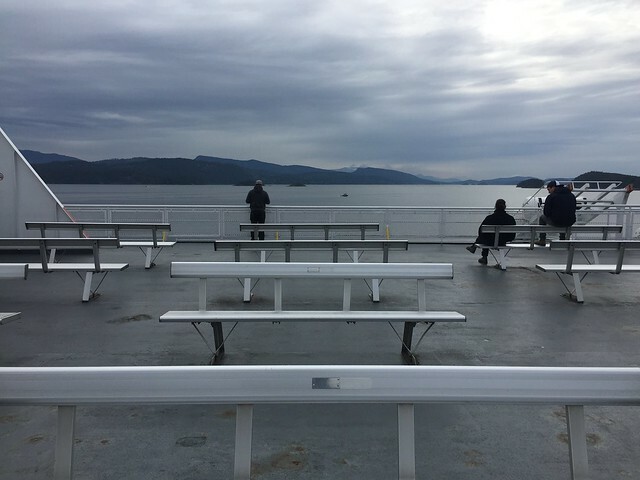 In the gasps of wifi at ferry terminals, news came in that everyone was out of town or busy. 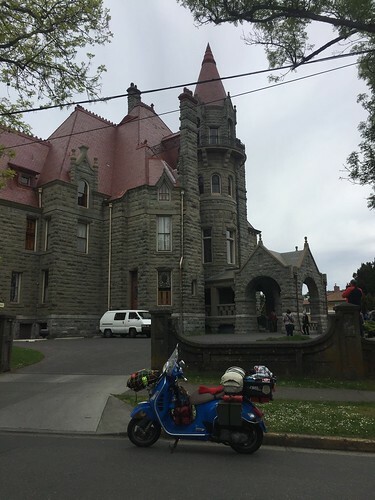 A few hours before arrival, Rob, the web designer for the Vespa Club of Canada, offered his spare room in New Westminster. I couldn't have been more grateful. He grilled up some chicken fajitas for dinner with his family, and I didn't even mind when his precocious teenaged son, Sam, immediately steered conversation towards religion and politics (ugh, what an awkward time to be an American). We passed the evening on subjects safer and nerdier than America: watching the pilot of American Gods. Juuuuust fits. Whew. Hi, Rob! Thanks for rescuing a random scooterist, Rob. 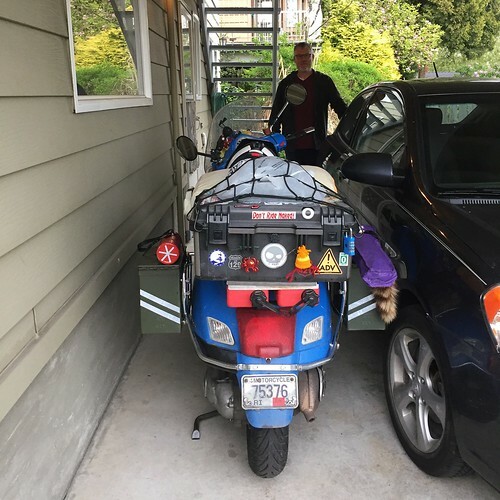 Next day: that time my Vespa was so heavy the lift couldn't reach the top notch. 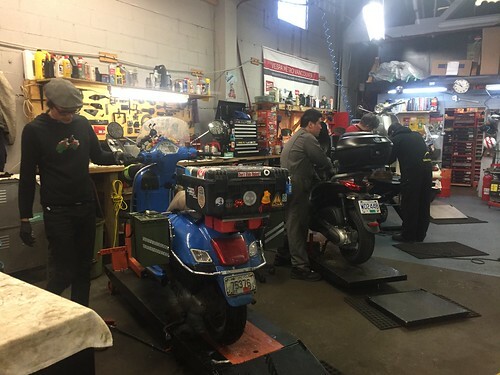 Chris from Vespa Metro Vancouver reached out to me, making him the first ever Vespa shop to reach out, and friendlier guys you could not meet. 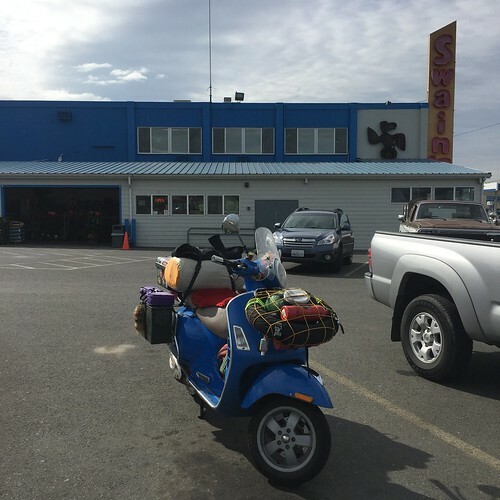 They were the northernmost Vespa service shop in the Americas, and offered to look over my bike before its Alaskan haul. At the time, I believe I had ~64k miles on the odometer, which I didn't realize is over 100,000km! It sounds way more impressive in metric, and Chris put a little note on their high mileage wall. 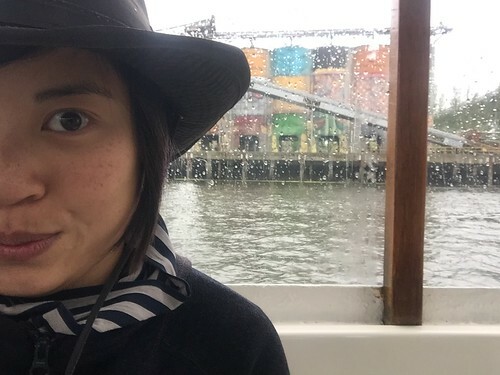 The skies were heavy with rain, so I ended up parking my bike at the shop for a few hours while Gwynne, who had just arrived by bus, and I explored the city on foot. Ramen, for a cold damp day. 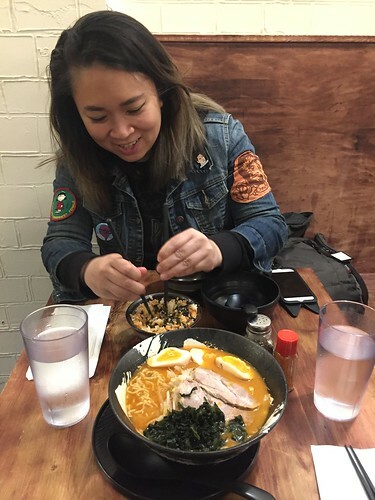 Yah Yah Ya Ramen downtown. 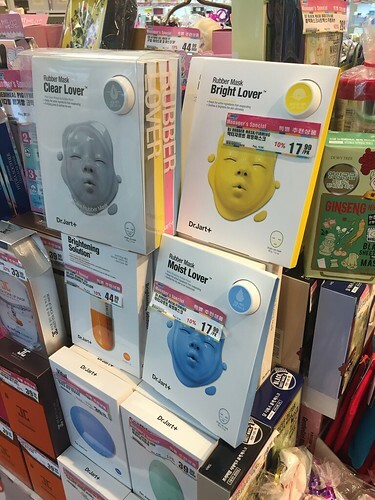 Learning about the bizarre and fantastic world of Korean beauty products. "It looks like a mini Star Ferry!" said Gwynne, referring to the tiny Granville Island ferries. 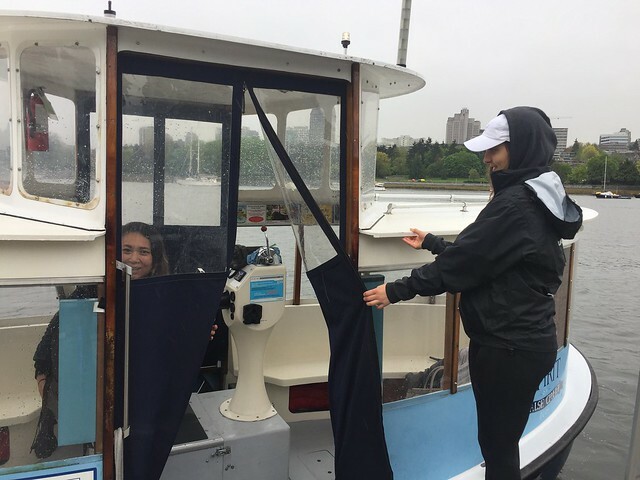 Clearly, we had to go for a tiny ferry ride. Ferry #3.5! 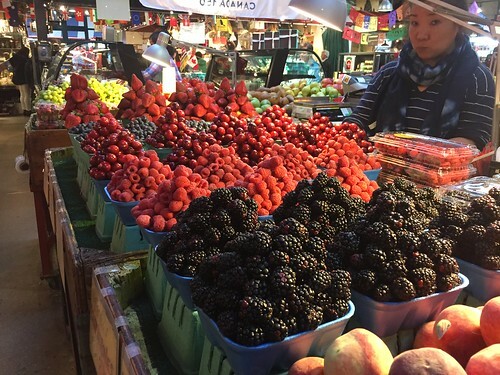 All the scooter-sized snacks caught my eye at the Granville Island Public Market. It was great to see Gwynne one more time before heading into the northern beyond. 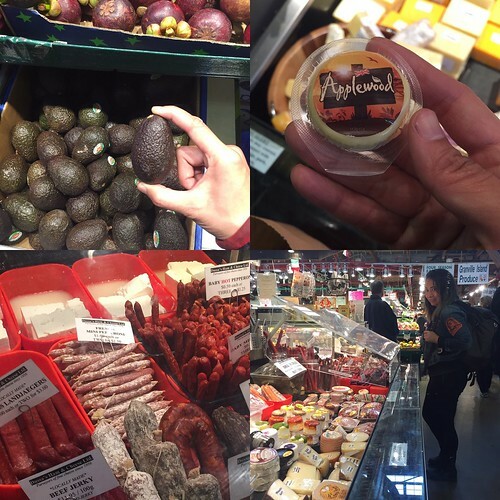 I made away from the market light, with just some adorable French sausage sticks the size of birthday candles, and a handful of donut holes for the house back in New Westminster. If only this rain would let up. Very nice Steph. You walked in my footsteps from just weeks before.